Mon - 6.5 miles easy. Giles Lane - Tyler Hill - Crab & Winkle - Blean. Tues - 11.5 miles (500') w/5k race (18:05, 1st). 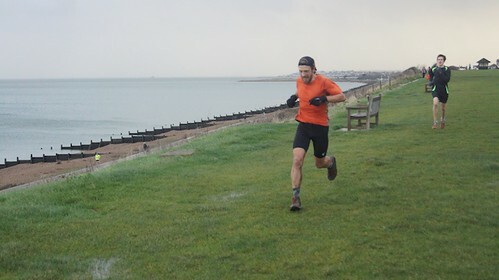 Ran over to Whitstable again on the Crab and Winkle bridle path to run my second Parkrun race of the visit. 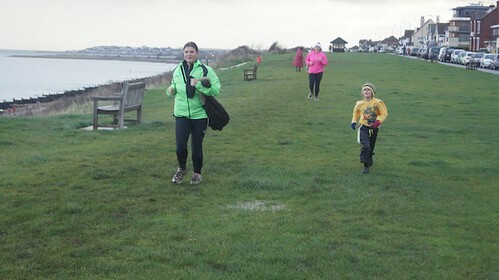 This time we were on the two lap promenade/Tankerton Slopes route, which meant that half the run was on challenging waterlogged grass. Went through the first kilometer in 3:15, chasing a young lad who got out a little quicker than I was planning on running. He maintained a five meter lead on the 1.5 kms of paved promenade and then began to fade as we ran up the hill onto the grassy Tankerton Slopes. By the end of the first loop I was ahead by a couple of seconds, a lead that remained about the same through the promenade section of the second loop and then grew significantly once we turned back onto the grass. This was an excellent way to start Christmas Day, made all the better by jogging out a third bonus loop with Alistair and Dana who had driven over to take part as well. Stella sits and waits in the wind with her Grandad. 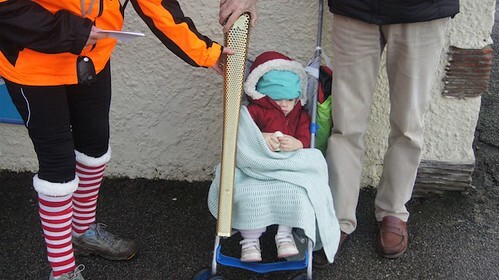 Not even the Olympic torch could pique her interest in the proceedings, however. Finishing up the first loop. Dana and Alistair had fun in the mud. Wed - 4 miles race. Boxing Day Run. Thurs - AM: 6.5 miles easy. Giles Lane/Tyler Hill loop in the wind and rain. PM: 3 miles easy with Dana. Two university loops. Fri - AM: 6.5 miles easy. Giles Lane/Tyler Hill loop in the rain. PM: 3 miles easy. 2 x Uni loop in the rain. Sat: 16 miles (800') w 5k race (17:20, 2nd). 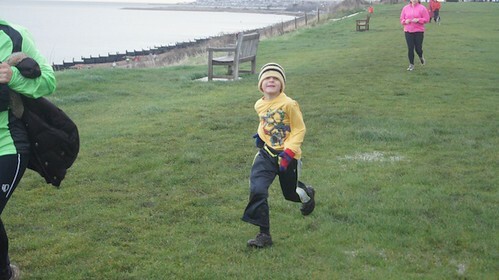 Ran out to Whitstable for yet another Parkrun race. I was feeling a little tired standing on the start line for this one, my third race of the week (and fourth of the UK visit), so purposefully lined up a couple people deep to avoid going out hard. Two guys got out quickly and by the time I had moved around traffic they were already ten meters up. The younger of the two started coming back through the first km (3:16), but the lead runner looked like he would hold his pace, slowly building his lead on me to about 10 seconds as we made the turn at the end of the lollipop part of the course. We again had to deal with a good bit of slop on the lollipop section of the course, but significantly less than on the standard route (which we ran Xmas day). By the time we were back on the promenade with 2kms to go, the race for first was clearly not going to happen, so I just pushed on and enjoyed yet another opportunity to breath in the beautiful sea air and enjoy the vistas. Ran back home to Canterbury after the race into a super-stiff head wind. Sun - Off. Set the alarm to get out and jog a couple of miles before catching the train to London to meet old school chums, but rolled over and caught some extra zeds instead. This week was billed as my first in the training cycle for the 2013 season, but it was about no more than building a bit of consistency and getting into the rhythm of things. I am determined to keep the mileage completely reasonable and non-taxing through January and February, with a goal of 60 miles this past week and no more than 70 this week (with a slow 5 mile per week progression from there). I'm starting to mix in a couple of double days now, just as a means of feeling my way back into the double day routine, and not really as a means of accumulating mileage. I find doubles to be an effective way of building mileage during peak training blocs, but it takes a while to get into the rhythm of heading out the door so often, hence the 'practice' right now. I ran three races this week, which was a lot of fun, with the highlight being the always fun Boxing Day Run in Saltwood where I put in a proper effort in hilariously muddy conditions. One more race tomorrow on New Years Day, and then back to The Fort and some hills. Hi! Have you ever been involved a situation when a person has stolen your articles? Can't wait to hear from you.